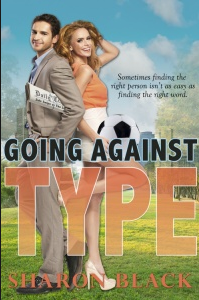 Sharon Black’s new novel Going Against Type raises interesting questions about journalists: How do they respond to and take advantage of common (mis)conceptions about gender? Where exactly is the beef (read: news) and how much can be hidden in a byline? When career and romance clash, which one wins? Should there always be a winner? Most importantly, if sports journalist Charlotte Regan is thrilled that her rival, a fashion writer and gossip columnist, thinks she is a man, then why does she immediately assume this opponent is male? Going Against Type matches love against professionalism (read: career ambition) as a test for human nature. The writing is fast-paced and witty, well illustrating the typically crazy, chaotic and competitive newsroom. It fits the common stereotype that within this room is plenty of strategic planning and careful calculation of all odds and ends, while the outside appears to be a glamorous world where personal charisma and a thick hide can help to achieve success. There are some excellent sentences in Going Against Type, especially among the writings of the two rival columnists. However, the book clearly validates a common writing rule: When in doubt, cut the adverbs and even the adjectives. Meanwhile, although it is sometimes a good idea to scatter around the puzzle pieces and encourage readers to be deductive, this is ultimately a romance story, not a detective novel. The storyline can be further tightened to better showcase the protagonists, with the alternative being to lengthen the book by digging deeper into the subtle emotional and professional challenges they face. What I learned from this book: Editing is crucial in bringing out the best of a writer and rigorously tidying up his/her story. Transparency: I was given a copy of Going Against Type by its author for review.